Recommend. Recommend. Recommend. Meaningful soundtrack. Gorgeous animation. Beautifully developed characters with a strong and deep connection to the real state of affairs in today's society. Corruption should be pursued, uncovered, and put on blast. A masterclass in showing how to setup atmosphere in an anime. 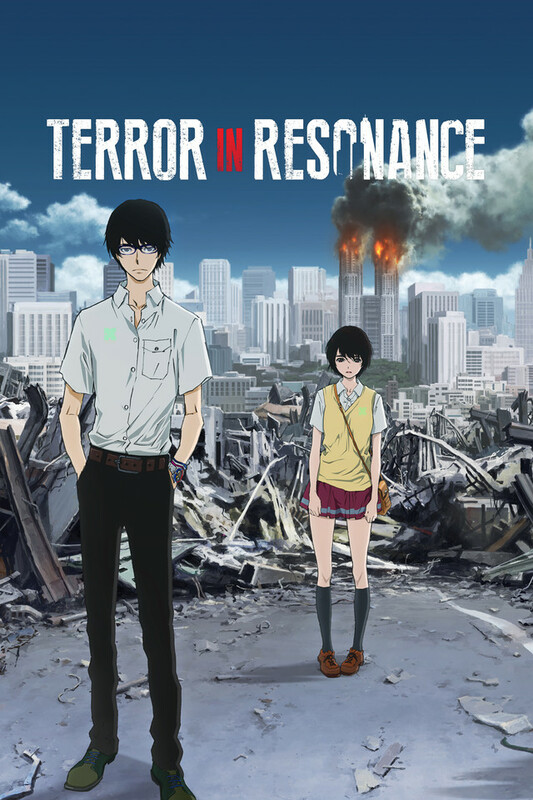 Terror In Resonance (TiR for short) was amazing. In one word I would say that it was one of the most refreshing animes I've seen lately. Doing away with the conventional good/evil and giving us proto-antagonist/protagonist characters, it's hard to determine who is good and who is evil for a large portion of this 11-episode canon, which works strongly in favor of helping develop the enigmatic world of TiR. I loved the world the developers created in this so much that I'm willing to see past it's mistakes and still give it full marks for how alluring the first half of this anime is. The opening arc is some of the strongest writing I've come across in any film/tv medium - it's that good. If you're looking for some of the mystique similar to Deathnote, Death Parade and Ghost in The Shell... I highly recommend TiR as an addition. An interesting and well-written story. I found the story to be quite enthralling and enjoyable. I really became attached to the main characters throughout the roller coaster of the plot, which was very cleverly written. My only complaint was the lack of development for some of the characters, but that can be excused in the fact they only had 11 episodes to tell the rest of plot in this amazing anime! Thank You For This Masterpiece In Resonance. I am really trying to gather my words in order to convey what this tale had to say. Such a powerful story. absolute and cunning characters. Spectacular visuals and stunning music. I'm really at a loss for words. Terror in Resonance had an astounding begining. I was expecting a lot from the first episode. It definitely delivered and surpassed any expectation I might have had. The music and BGM a real was a blessing; to be remembered for years to come. The main characters were crystal clear. Determined with motivation and purpose. There was some extraordinary development to the story from start to finish. Especially the last three episodes. They were an emotional adventure. Also unique to the series was the importance of watches. There are many different and classic watch designs depicted that I really appreciated seeing. As for the finale, thoroughly beautiful. It was cunning and gave us the conclusion needed by such a heavyweight story. I really won't say any more. Please. Turn on your speakers, focus and engage in this masterpiece by Shinichirou Watanabe. Please let there be more series to reach this level. This anime is as beautiful as it is rushed. You start watching for the mystery and stay for the beauty, going through a roller coaster of emotions that will inevitably crush your heart at full speed in the end. The story starts off at a normal pace, slowly introducing the characters and their personalities. Their motivations stay a mystery for a great part of the series, which is one of the main reasons you simply can't stop watching. But then come some issues with pacing and character development: 11 episodes were definitely not enough to bring this beautiful story to its full potential. Despite these issues, the plot never becomes completely predictable. One example of this is five: her background is never fully explained, and her death seemed incredibly rushed. She feels more like a plot device to advance the story and give you a feeling of tragedy than a fully developed character. Even her involvement with the FBI seems like a huge stretch. Lisa herself is often just "the tragic girl who becomes the main characters' weakness", through much of the series. It would've been nice to see them develop a relationship at a less rushed, more convincing pace, and see more of her development. Twelve and Nine were as well developed as their screentime allowed them to be - both mysterious and relatable in unexplainable ways yet with distinct personalities, there are enough clues to show you they're not average schoolchildren, but neither are they heartless terrorists - so why are they doing this? The art is beautiful. While it's often not particularly exceptional (though definitely well done), it surprises you during scenes in which characters are reflecting about their actions or showing their feelings. The same can be said about the music - instead of merely instrumental pieces, there's often songs with lyrics that fit perfectly with the art and plot, which was somewhat unexpected. The art style was interesting, since it often showed characters somewhat detached from the static, considerably more realistic background. However, it didn't feel like "bad animation", since it fit perfectly with the vibe of the series - run down surroundings instead of perfect houses, blurry, warm toned backgrounds when it was hot, always dreamy, rarely colourful. When the art escaped these parameters (those night scenes! ), you *knew* something important was going on. Both the opening and ending are very fitting, but the ending song Dare ka, umi wo is a tragic, melancholic masterpiece. It kept pulling me into the next chapter because I couldn't stop listening to it. Overall, I wish these series had been a bit longer and better developed, it certainly deserved a few extra chapters to add more character development. However, it still managed to create a beautiful atmosphere of inevitable tragedy you can't keep your eyes away from, and for that, it gets 4 stars. I love this anime so much! I think a lot of the reviews of a lot of anime are very harsh and based off of a critics standpoint. The reality is that most of us really just watch the anime to watch it and we don't care about the minor details as long as it captures our interest. This anime did exactly that for me. I loved the soundtrack and how emotions and events were portrayed for different characters. Some episodes seemed like they didn't have too much action but that is easily overlooked in my opinion. Great anime overall! RECOMMEND. in the begging i wasnt too into the show but, honestly how it develops is thrilling, the soundtrack f*cked me up it's too good i have never seen something like that in an anime. I don't know if it's a unpopular opinion, but I really enjoyed Lisa's character and how she played an important role in the story. Also, how she is the cutest cinnamonroll ever. Nine and Twelve are just ;-; too precious;-; for ;-; this world ;-; and i'm typing while sobbing. The pacing the story, the twist, the feels its all different from other anime's, especially the ones in the popular list currently, you just need to watch it. Like right NOW you will not regret it and by the time you know it you will be wishing for more. This is one of those anime where you actually enjoy every episode. The characters all have their own unique feel to them which gives the show a little more flavor. There really is no climax to the show, it just keeps climbing and climbing, excitement in every episode. I wholeheartedly believe that isn't an anime. The artwork and the techniques used for animation are lovely. The characters demand empathy out of the viewer. The plot is unique. The engrish is pretty bad but that's actually pretty funny. The ost for the anime is a transcending experience, especially the opening. Overall, a beautifully unique experience with an ending that played my heart strings like a violin.